The Fundy Ocean Research Center for Energy (FORCE) is Canada’s leading center for research and demonstration of in-stream tidal energy technologies. Located in the Bay of Fundy in the Atlantic province of Nova Scotia, FORCE has been collecting environmental and site characterization data for almost ten years. Based on this experience, FORCE has a role to play in supporting informed, evidence-based decisions by regulators, industry, the scientific community, and the public. Research and monitoring in support of tidal energy development in the Minas Passage have been taking place for many years. Since 2009, more than 100 research related studies have been completed or are underway with funding from FORCE, the Offshore Energy Research Association of Nova Scotia (OERA), and others. These studies have considered socio-economics, physical oceanography, benthic habitat, and biological research areas such as the potential effects of tidal turbines with respect to fish, seabirds, marine mammals, lobster, marine sound, and other environmental variables. A key component of monitoring efforts at the FORCE site is Passive Acoustic Monitoring (PAM). PAM efforts (i.e., ‘listening’) help us to understand how the sounds of an operating turbine contribute to the existing soundscape of the marine environment and how in-stream tidal energy turbines may impact marine animals, either directly or indirectly. C-POD attached to a SUBs package used for Passive Acoustic Monitoring in Minas Passage. 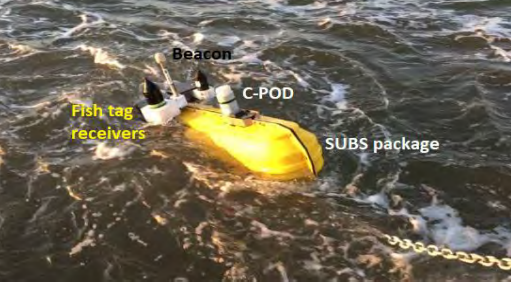 More than 4,650 PAM monitoring days have been completed in the Minas Passage using PAM instruments known as C-PODs attached to Streamlined Underwater Buoyancy System (SUBs) packages (pictured left) for retrieval. C-PODs have been deployed on a semi-regular basis since 2011 and are used to log marine mammal echolocations in their detection range. Of key interest to FORCE and researchers has been the harbor porpoise (Phocoena phocoena), the most frequently documented marine mammal in the Minas Passage and the upper Bay of Fundy. Five C-PODs were deployed in and around the FORCE test site before and during the operation of a two-megawatt OpenHydro tidal energy turbine (November 2016 – June 2017). Overall these instruments (up to May 1, 2018) detected harbor porpoise on 98.9% of days at a median of seven detection positive minutes per day and a maximum of 44 minutes. Further analysis indicates that harbor porpoise use and movement in the Minas Passage varies over long timescales, with two clear seasonal peaks and lunar cycle-related variability, as well as shorter timescales relating to day/night periods and tidal stage. These studies highlighted that porpoises were not excluded by turbine installation and operations over the mid-field study area (200-1700m away from the turbines), with click detections occurring on 98.5% of 130 monitoring days. However, statistical models identified a significant decrease in porpoise click activity at the two monitoring sites closest (200-230 m) to the operating turbine berth. The C-PODs at two sites that were more than a kilometers away did not show a significant turbine effect, while the activity at the most distant site increased. Decreased detection rates were clear during turbine installation activities and are likely attributable to the increased activity of large vessels associated with turbine installation; consistent with temporary declines in marine mammal presence observed elsewhere (i.e., studies of the SeaGen project in Strangford Lough, Northern Ireland documented temporary displacements of harbor porpoise during turbine installation activities). These initial PAM findings at the FORCE test site provide an early picture of turbine/marine life interactions. Longer term monitoring over a full annual cycle and in association with multiple different turbine technologies will be necessary to make a proper evaluation of the environmental effects of the tidal energy sector. FORCE releases quarterly and annual reports on the state of research and monitoring at its site. These reports are available at www.fundyforce.ca/environment/monitoring or they can be found on Tethys. The 2018 report can be found on Tethys here.